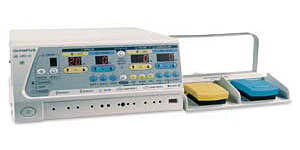 The Olympus UES-40 is an electrosugical generator that can be used with the VirtuoSaph® Endoscopic Vein Harvesting System and the VirtuoSaph Plus Endoscopic Vessel Harvesting System. Please contact your local sales representative for more details. Only applicable for VirtuoSaph Endoscopic Vein Harvesting System. VirtuoSaph Plus Endoscopic Vessel Harvesting System has an integrated, single use, bipolar cord. Manufactured by Olympus Corporation, Tokyo, Japan. Distributed in the U.S. by Terumo Cardiovascular Group, Ann Arbor, MI. Contact us today for clinical or sales support. Products shown in this website are available in the United States. For product availability in your region, contact the Terumo Sales Office nearest you. © 2019 Terumo Cardiovascular Systems Corporation. All Rights Reserved.